The Five Mile Creek runs through the center of the Woodend township and is a major open space asset for the community of Woodend. The creek catchment supports a range of threatened flora, fauna and vegetation communities and in particular the Black Gum. 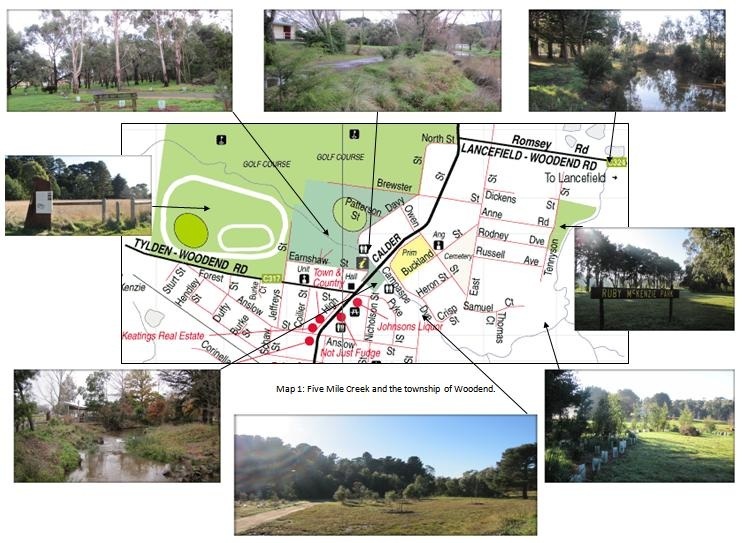 Woodend Landcare have been working along Five Mile Creek for over 20 years, primarily on woody weed control and revegetation. In the past eight years at least 20 working bees have involved the larger community and schools in bringing the creek back to a healthy waterway and about 12,000 indigenous plants have been put in the ground. A Waterway Action Plan for Five Mile Creek was developed by NCCMA in 2004. This plan was reviewed as part of a community consultation process instigated by Woodend Landcare in 2011. This review process saw the completion of a plan that outlines a vision, as identified by stakeholders and community, to improve the Five Mile Creek. It also addresses the important issue of ongoing management and maintenance responsibilities for on-ground works that are undertaken along the creek. In doing so it identifies the level of involvement that people and groups are prepared to commit.